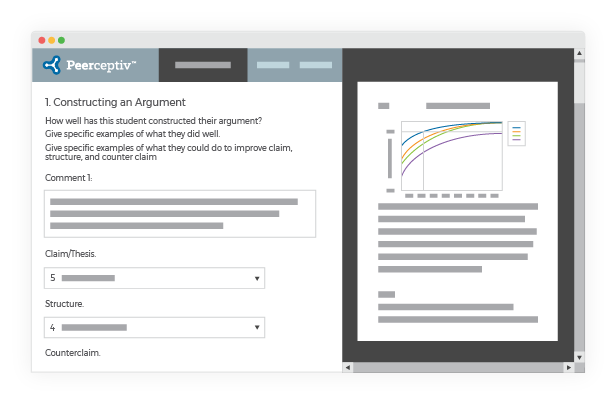 Peerceptiv®, a research-validated peer assessment technology, creates a virtuous cycle of feedback in your classroom that improves writing and critical thinking skills. 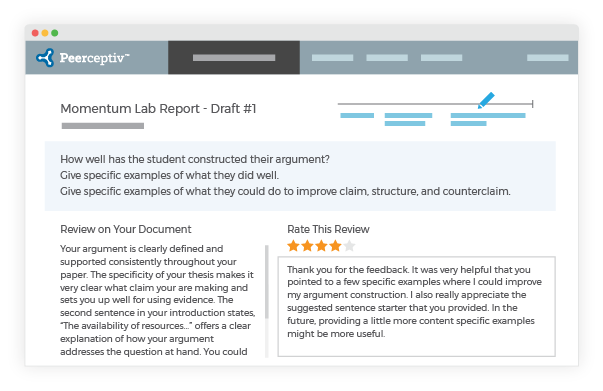 This online peer assessment tool allows students to receive quick and actionable feedback from their peers to improve their writing. When they act as reviewers, students engage in the role of the teacher, improving their meta-cognitive skills. Peer assessment accelerates the feedback loop while providing a greater amount of actionable feedback to students. Students grow quickly and learn deeply, because Peerceptiv provides a number of benefits for both teachers and learners. Peer assessment allows your classroom to become a community of learners working toward each others’ academic success. As students work through the process of reviewing their own and others’ writing, they gain a deeper understanding of the course content while improving writing and critical thinking skills. Peerceptiv’s online peer assessment tool encourages students to be active learners throughout the assessment process. Peerceptiv’s Team Member Evaluation tool offers a way to evaluate team members’ contribution in any group project, with reviews remaining anonymous. Use our standard characteristics: Professionalism, Communication, Content Knowledge and Skills, Work Ethic, and Overall Contribution, or edit the characteristics however you wish. Instructors, administrators, or HR professionals can use the completely customizable tool to gain quantitative and qualitative data about the dynamics of each group, and the group members gain valuable insight that can help them improve their collaboration skills. Team Member Evaluation can be used as part of a Peerceptiv group assessment or on its own. Peerceptiv’s research-validated framework provides a platform for truly collaborative learning. Collaboration is most successful when students with diverse perspectives push each other to improve. With instructor-created commenting prompts, students are encouraged to provide high-quality, constructive, and specific comments to one another. Students not only benefit from receiving constructive feedback, but also from giving it. Commenting on a classmate’s work, both good and bad, is a valuable learning opportunity. We’ve all heard the saying “You don’t know a subject until you try to teach it” — Peerceptiv gives students the opportunity to act as teacher to their peers, providing a valuable opportunity for growth. track student progress through assignments. These analytics are specifically designed to improve higher order skills, like critical thinking, writing, and argumentation. Instructors can track student growth in any of these skills by utilizing standards-based rubric dimensions with this online peer assessment tool. With IMS Global Caliper Analytics compliance, institutions can see metrics that measure the success of using Peerceptiv. Peerceptiv is a double-blind peer assessment technology. Reviewers do not know the identity of authors, and authors do not know which classmates wrote the reviews they received. 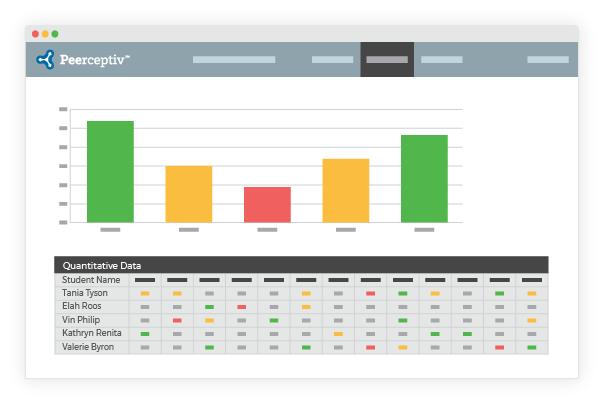 Peerceptiv reduces inherent bias that is common in traditional assessment practices. Instructors can feel confident that feedback and grades are based solely on predetermined performance rubrics, resulting in a true measure of student mastery. With anonymous reviewing, students are empowered in the role of reviewer, no matter their ability level or cultural background. When peers review each other anonymously, diverse perspectives accelerate student growth. Over a decade of research has demonstrated how our bias-free online peer assessment tool ensures higher quality feedback. Peerceptiv’s automated grading algorithms are a result of a decade of research at the University of Pittsburgh’s Learning Research & Development Center. 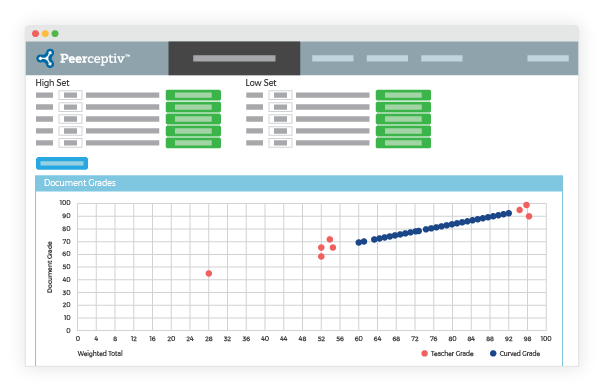 Using peer ratings and reliability data, Peerceptiv can generate grades that are as accurate as traditional instructor grading, allowing the instructor to spend more time teaching and less time grading. Every class is different, and Peerceptiv allows instructors to participate in the assessment however they’d like. 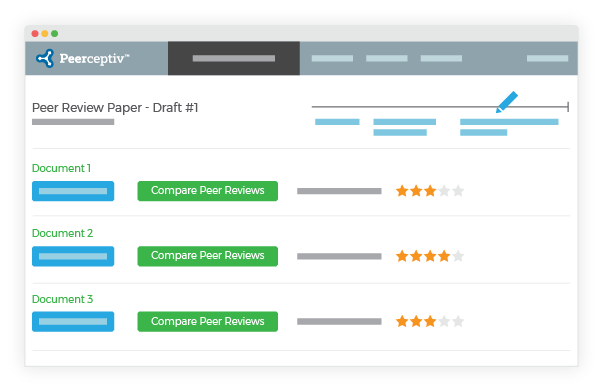 Whether it be grading a few documents as benchmarks for the class, or reviewing every document, the flexibility of Peerceptiv works for you and you can trust the grades Peerceptiv generates.